My 2.5 year old son is wearing the costume. I got the idea online after weeks of searching for the right thing to make. I like crafts and last year someone gave me a bin of old craft stuff which included a ton of felt. I never use felt so as soon as I saw this idea, it was perfect to use all of it that I had sitting in my basement. I used an old pair of ripped sweatpants and an old sweater underneath. Cut up cardboard boxes for the nose and ears. Streamers for the tail and ears. I attached everything using a hot glue gun. The only things I had to buy were two rolls of streamers and two packs of glue sticks (because I had two and used about 4 packs), so it cost me roughly $6. 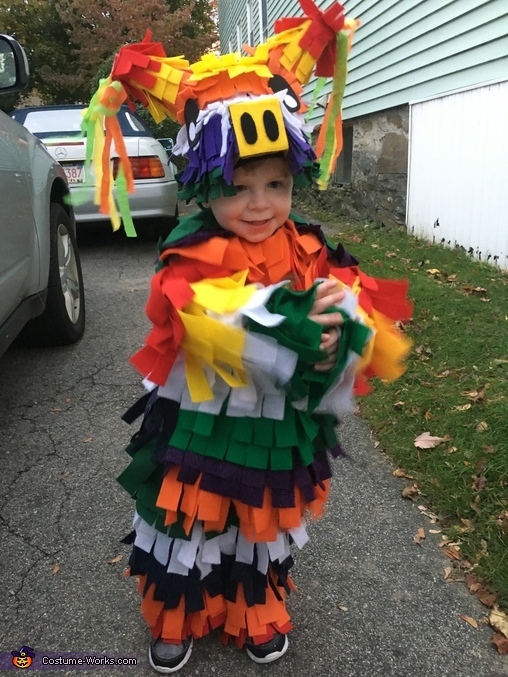 He was very warm and didn't love the hat, but the whole thing stayed intact throughout trick or treating and he was a great sport.